Update: There is a new low voltage version of the MAX232 called MAX3232. I updated my converter revently and it works fine with 3V from two batteries now. This article describes how to build an extremely compact converter circuit built around the MAX232. With a size of just 14 x 17 mm (0.55 x 0.67 inch) the PCB is small enough to fit into a D-SUB plug housing as shown in the title picture above. 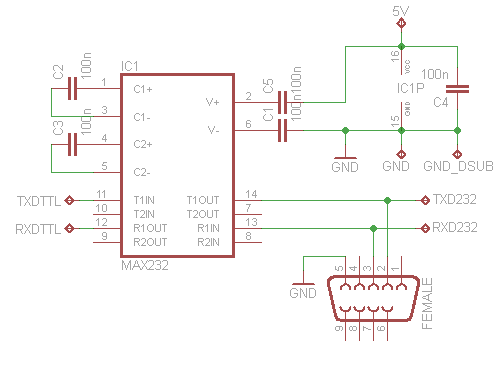 When designing a new AVR circuit you just have to connect the converter to the AVR and you're ready to communicate in both directions. 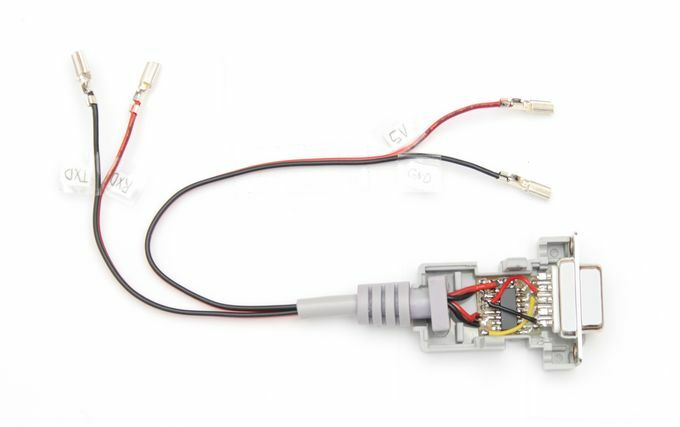 The circuit is shown in the images below. It's a standard application of the MAX232, the only point worth mentioning is that the thin SO16 version of the MAX232 was used in the PCB layout. There are alternative versions of the original Maxim chip, e.g. from TI (also named MAX232) or ST called ST232 (my favourite). They are usually cheaper then the Maxim equivalents. Some older MAX232 versions need 1 uF capacitors instead of 100 nF required by the newer types. All five caps on the PCB are 0805 SMD packages. The prototype PCB shown in the first picture is mirrored because of a stupid fault, however all files provided for download below are correct. At this point I'd like to mention that soldering SMD parts is not as difficult as it might seem. It doesn't require any special motor skills. All you need is a soldering iron with a sharp tip and thin solder! There is a variety of terminal programs for serial communication. HyperTerminal is included in Windows, HTerm or Br@y++ Terminal are good alternatives. Don't forget to deactivate all protocols (flow control: none) when sending data to the controller. All files necessary to build the converter are provided below. 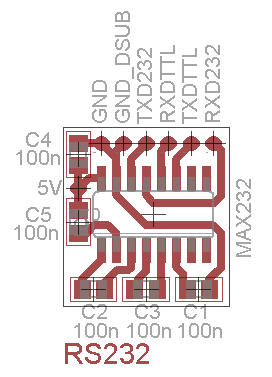 If the given PCB layout doesn't fit into your plug, use the Eagle files to rearrange the parts as necessary. This makes me wonder if it might be possible to create an interface between my Yamaha PSR-740's floppy disk drive and "something more modern." An SD card? USB port.... It's getting old and transferring via sneaker net is becoming unreliable. Plus it's ALWAYS been slower than molasses in winter. Any ideas, you geniuses? USB to TTL is great for debugging from PICs or ATMEL devices if your Laptop does not have a serial port. Nice tips, your blog impress me ! Thanks so much for these tips on how to build an extremely compact converter circuit built around the MAX232. I have been tinkering about with these sorts of things for a while but I'm still a real newbie really.